Jump starters are a reliable way to start a dead engine—if there’s another car nearby to hook them up to. If you’re by yourself, though, jumper cables leave you stranded. That’s where a Noco jump starter can be a godsend. These self-contained units will bring a car battery back from the death in 3 seconds flat. 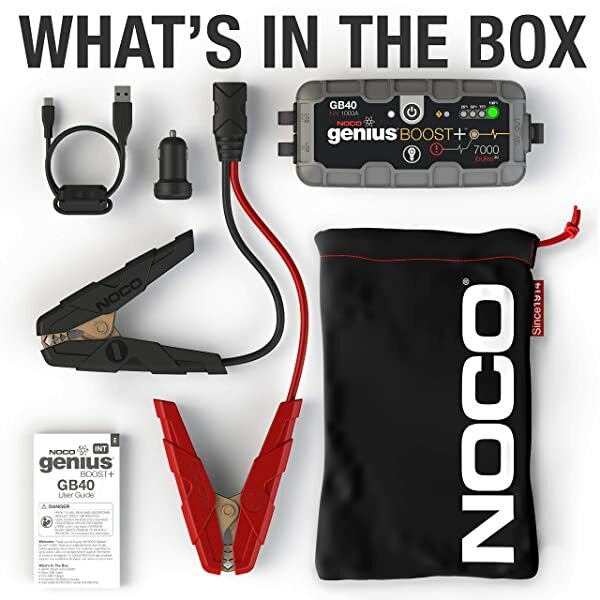 Most jump starter packs aren’t very portable, but the innovative lithium-ion design of a Noco jump starter makes them different. They’re compact and hold a charge well, which makes them the perfect choice to keep in your trunk for emergencies. Sound like something you need? There are a lot of options in the Noco catalog, and you’ll find one for every engine size and environment. We’ve reviewed our three favorites below. One of them is sure to be the ideal jump starter for you! This is a great option for the general consumer who wants value and convenience in a jump starter. Let’s start off with a jump starter that’s an exceptional value. It’s the most affordable option on the list, for starters. On top of that, it comes with all of the clamps and cables you need to use the starter. There’s even a built-in LED flashlight with modes for sending emergency signals. The NOCO Black Boost Plus GB40 also scores high marks for convenience, too. It is compact, lightweight design makes it super portable. In addition, it gives you the option to charge via USB, and a USB cable comes included. 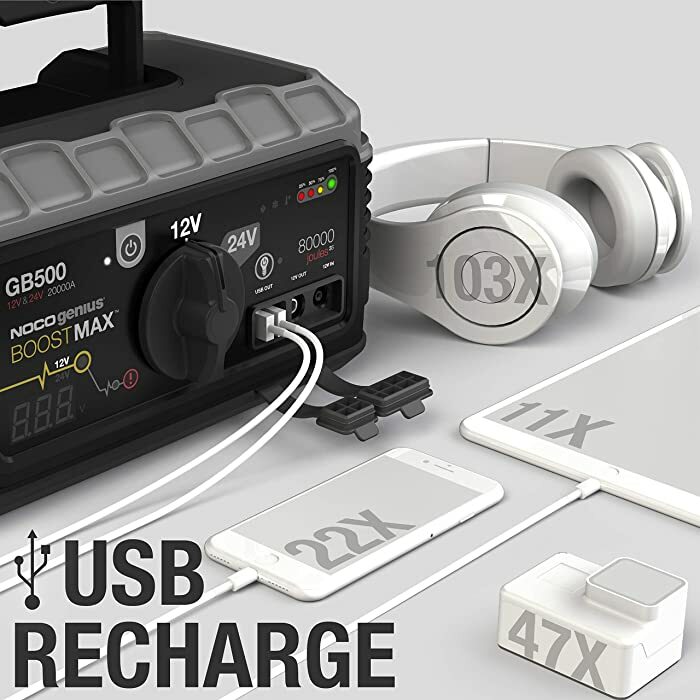 You’ll never be stranded with a dead phone again with the GB40 in your trunk. Basically, the GB40 is an all-in-one roadside tool. It’s not the most powerful charger on the market, but it will be plenty for standard-sized vehicles. Fully charged it’ll jump up to 20 batteries. And you can let it sit up to a year between uses, too. This is a jump starter you can always count on when you need it. GB40 UltraSafe Lithium Jump Starter, HD Battery Clamps, 12V Car Charger, Micro USB Cable, Storage Bag, User Guide, 1-Year Limited Warranty are included. The most affordable high-powered jump starter, the GB70 is a great choice for RVs and boats as well as cars. It’s also perfect for extreme conditions, reliably jumping engines even in sub-0 temperatures. For a mid-level option, you’ll definitely want to check out the GB70. It gives you about twice the cranking power of the GB40 above without adding much bulk. And at just over five pounds, it’s still a very portable jump starter—much lighter than any lead-acid jump starter. 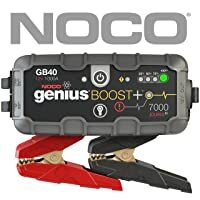 Like the model above, the Noco Genius Boost HD GB70 has a USB connection. This lets you use it as a charger for devices ranging from smartphones to air pumps. It’s more powerful than the GB40, though, starting 8-liter engines with ease. This added power also makes it more reliable in cold weather. This is a jump starter, not a charger. If you use it to fully charge phones or computers, it will drain quickly. Having said that, the GB70 is also quick to recharge, going from empty to full in less than two hours. With the rugged design and easy-to-use interface, it’s a powerful and user-friendly option. A heavy-duty option suitable for commercial trucks and equipment. It gives you ten times the power of most jump starters—at about ten times the cost. While it’s very appealing for a professional driver, it’s outside the budget of the average consumer. Do you want the ultimate in professional jump starter technology? 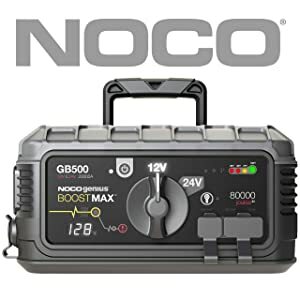 Look no further than the NOCO Boost Max GB500. While it doesn’t come cheap, it does give you the most power on the market. If you need to jump-start commercial vehicles or multiple-axle trucks, the GB500 will get the job done. Everything that’s on the models above you’ll also find here—but in a more powerful form. Even the included flashlight has more lumens. With up to 6 hours of run time, you can charge all your devices and still jump start your truck. All Noco jump starters are rugged, but the GB500 is a real tank. It uses Noco’s patented Boost Max connectors, which lock into place to avoid slipping and broken connections. It’ll work in any weather, on any engine—even commercial and multi-axle engines. Overall, it’s the most versatile and powerful jump starter you’ll find. Obviously, if you’re looking for pure power, the GB500 takes the cake hands down. For your average consumer, though, a thousand dollars is too much to spend on a jump starter. Taking cost and portability into account, our favorite is the GB70. It has enough power to jump-start an SUV or RV but only weighs around 5 pounds. The all-weather reliability is great, too. No matter where you’re going, you’ll get there safely with this guy in your trunk. As you can see, Noco has a jump starter for every vehicle and price point. The peace of mind they’ll bring you is well worth the cost. Added features like USB charging and an emergency flashlight are honestly icing on the cake. Noco is an American company that’s been making consumer electronics for over a century. They started as Nook & O’Neill back in 1914, and since then have been consistently at the cutting edge. Their contributions to engine technology are even recognized by the Automotive Hall of Fame. For modern consumers, Noco is synonymous with power and innovation. Their Genius Boost jump starters are only their most recent groundbreaking development. When you get a Noco product, you know it’s both well-designed and reliable. 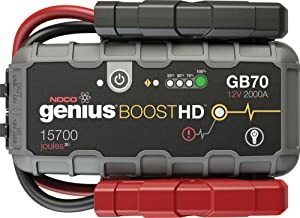 What is a Genius Boost? This is the name Noco has given to their full line of lithium jump starter models. Their main advantage over traditional car jump starter designs is their portability. Lithium batteries have a higher energy density, letting them cram more power into less space. And the difference is obvious. The 2-pound GB40 is less than half the weight of any lead-acid jump starter pack. In fact, it’s lighter than most jumper cable sets. Even the hefty GB500 is light compared to other commercial jump starters. How much maH does it take to jumpstart a car? That depends on the capacity of the engine and the size of the car. Most cars will only need around 400 amps to start up. This should also be enough for smaller pick-up trucks and SUVs. For a full-sized truck or van, on the other hand, you’ll need as much as 1,000 amps. Keep in mind that an engine is harder to start when it’s cold. If you live somewhere with harsh winters, buy a jump starter with a bit more power than your engine calls for. The starter won’t give more power than the battery needs, so there’s no risk you’ll do damage.